What is the true poverty situation in the Kingdom of Eswatini? A detailed answer to this question will be presented to the United Nations community in July. It will form part of a progress report on implementation of Sustainable Development Goals (SDGs) by Eswatini. 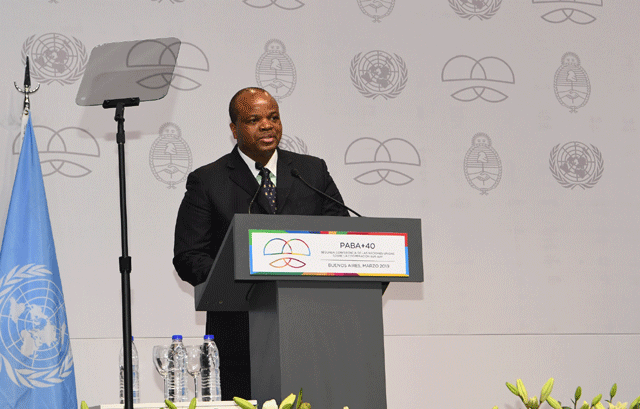 This was disclosed by His Majesty King Mswati III yesterday during the second United Nations high level conference on South - South Cooperation held in Argentina to deliberate on how developing countries can cooperate in order to be able to implement the SDGs by 2030. SDGs are part of the UN Agenda 2030, which is a call to action to end poverty, protect the planet and ensure that all people enjoy peace and prosperity. South-South Cooperation involves the exchange of resources, technology and knowledge between developing countries of the Global South. The king informed the conference that the government of Eswatini received financial support from India, through the United Nations South-South Cooperation facility, to conduct a participatory poverty assessment. This was done in November and December 2018. “The outcome of the assessment will feed into policy revision and programme development for coming up with new intervention measures,” he said. The king assured that government took seriously the poverty challenges and did not want to leave any citizen behind in its development agenda. “I am pleased to inform this august Assembly that in July this year government will be presenting a comprehensive report on the implementation of the SDGs during the high level forum on sustainable development in New York,” he said. Currently, the official status is that 63 per cent of the population in Eswatini lives below the poverty datum line; or less than a dollar a day. His Majesty said the country was open to the adoption of favourable national policies and regulations to promote cooperation that would leverage the pace towards achieving her national vision 2022, the 2030 UN Agenda, Africa’s Agenda 2063 and other emerging global agendas. His Majesty said the theme was highly appropriate as developing countries would be able to share the challenges they face in the implementation of the universal goals. It was during the UN General Assembly in 2015 that Heads of State and Governments agreed to implement the SDGs in order to achieve a better and sustainable future for all. The king called for a more visible show of commitment to fully address most of the SDGs, especially those relating to food security, clean water, education, health, inequality, jobs, land and climate change. He noted that SDG (1), was all encompassing and poverty was a cross cutting issue. “Addressing it will have a multiplier effect in almost all the other sustainable development goals, ensuring that no one is left behind,” he said. He recognised that much had still to be done to assist the global south to have access to affordable appropriate technologies to propel structural transformation globally, as underscored by the 2030 Agenda for Sustainable Development. This would entail working together to undertake beneficiation and value addition on our primary products, as this was also the spirit of our regional economic bloc SADC. “Our concerted effort would leverage the competitive edge of the south within the global market and therefore, enhance integration of the south into the global economy,” he said. He informed the conference that Africa was also working towards the Continental Free Trade Area, which would enhance trade between the South - South regions.